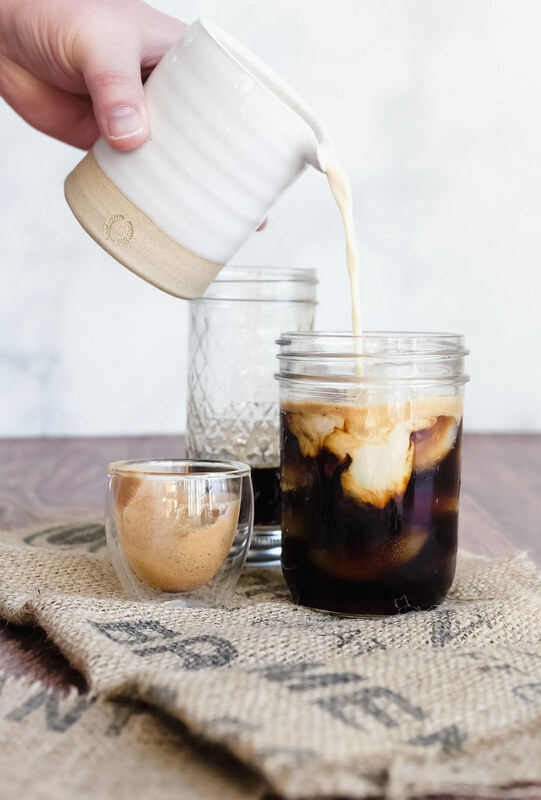 Let me show you how to make an iced latte at home! You’ll save a ton of money and all that time it takes to get to the coffee shop, drag the kids out of the car, and wait in line. You’ll be drinking your iced latte in your slippers in under 2 minutes at home! With the weather warming up, we’re coming into iced coffee season! 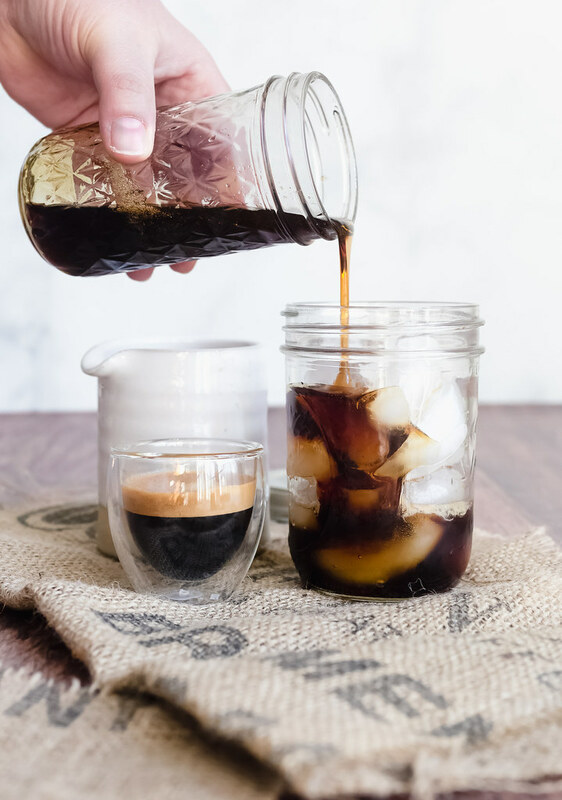 Are you an iced coffee or cold brew lover? Or are you like me and iced lattes are more your thing? If I had my choice and an unlimited amount of funds, I’d be rolling through the Starbucks drive-through every morning for an iced vanilla latte. Buuuut man are they expensive! Over $5 for a grande (medium) at Starbucks now? Sheesh!! It costs me less than $2 to make the same size at home. 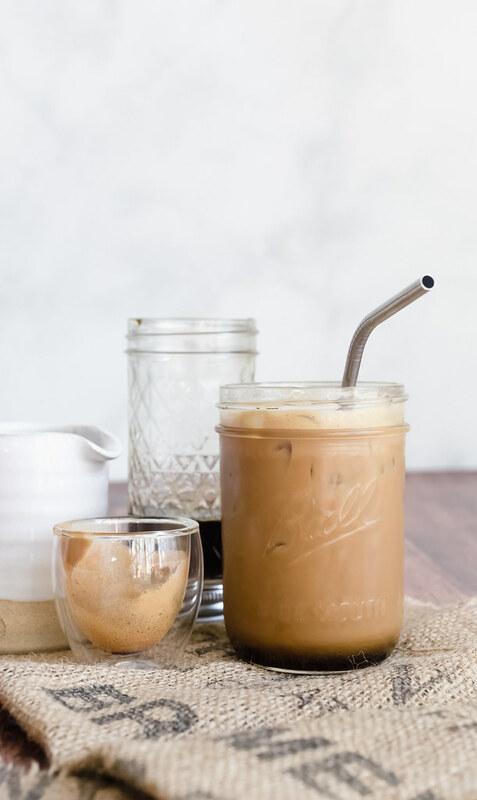 This is why I want to show you how easy it is to make an iced latte at home! What is an Iced Latte? You see iced lattes everywhere these days, don’t you? If you’re wondering what the heck an iced latte is, I’m here to tell you! An iced latte is simply milk mixed into espresso with ice in the glass. Yes! It’s that simple! What Kind of Milk Should You Use for an Iced Latte? You can use any kind of milk you want from whole to skim cow’s milk to almond, soy, or coconut milk. Or any kind of milk in between as long as you love it! Heavy cream and half-and-half aren’t really recommended for lattes. 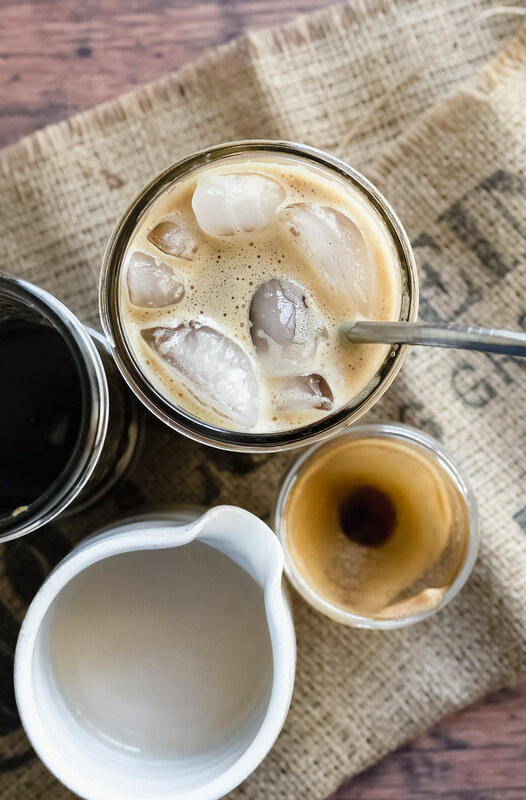 You’ll be adding 8 ounces of milk to your iced latte and the higher fat content in heavy cream and half-and-half doesn’t make them a great option for this drink. Do You Froth Milk for An Iced Latte? But for an iced latte, there’s no need to froth your milk. The reason for this is because hot milk will melt your ice. So you want to use cold milk for iced lattes. Using cold milk means that making iced lattes is much faster than making hot lattes since you don’t have take the time to steam the milk. Plus! There’s no extra clean up of the milk steamer. Does an Iced Latte Have Caffeine? Yes iced lattes have caffeine. That’s because the espresso used to make the drink has a high concentration of caffeine. And it’s important to pay attention if you’re trying to watch your caffeine intake: even decaf espresso has a little bit of caffeine in it. To cut down on my caffeine intake, I mix a shot of decaf espresso with a shot of regular espresso. And if I want to make an iced latte later in the day, I make it with 2 shots of decaf espresso. Otherwise, I would never sleep at night! Which is Stronger: Iced Coffee or Iced Latte? The strength of the espresso you make your iced latte with. Espresso is available in varying levels of boldness. Bolder espresso will yield a stronger drink. The number of shots you make your iced latte with and the size of the glass you use. If you make your iced latte with 2 shots of espresso in a smaller glass, there may be little room for the milk. This will yield a stronger latte. Conversely, if you make your iced latte with 2 shots of espresso in a large glass, it will take more milk to fill up your glass. Extra milk (and melting ice) will dilute the espresso and weaken the strength of the espresso in the drink. The strength of the coffee you use to make an iced coffee. Like with espresso, bolder coffee yields a stronger drink. Ounce for ounce, espresso contains more caffeine than coffee. One ounce of espresso contains about 63 mg caffeine. One ounce of coffee contains about 14 mg caffeine. However, since a medium iced coffee contains about 12 ounces of coffee (about 168 mg caffeine) and a medium iced latte contains 2 shots of espresso (about 126 mg caffeine), a medium iced coffee is actually stronger than an iced latte (source). Who would have thought!! How Do You Make an Iced Latte? So after all this talk about what kind of milk to use, frothing milk, and caffeine strength in an ice latte, let’s get down to making one! First step is you need espresso. Funnily enough, the espresso can be cold OR hot. Yep, that’s right! I brew my espresso right over the ice cubes in my glass. The ice helps to cool the espresso down and the cubes don’t seem to melt too much since there’s only about 1 ounce of espresso in each shot I make. I brew my espresso with my Nespresso machine. My god do I loooooove this machine! It’s fast and there’s no guessing game about how much water is needed because the pods have a barcode on them. The machine reads the barcode and adds only the exact amount of water that each pod requires for the espresso or coffee you choose. Like I said, I brew my espresso directly into my ice-filled glass. You could also brew the espresso in advance, like the night before, and let it cool. I’ve done this before and it works just fine. 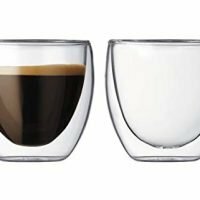 When I brew espresso to drink straight away or to make it in advance and chill, I like to use these little double-walled (insulated) espresso glasses. They keep the espresso hot longer when I want to drink it hot, and colder longer when I refrigerate it. 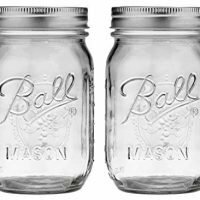 They’re just like the Tervis tumblers but made of glass instead of plastic. There are other ways to make espresso. An old-fashioned but still really cool stove top espresso maker works great too! 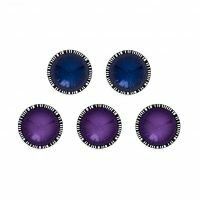 I have used this stove top maker in the past but switched over to the Nespresso as my go-to when we purchased it 2+ years ago. My mom uses still makes espresso (or demitasse, as the Italians in my family call it) on the stove top and it’s really easy to use! You just need to grind your espresso beans, add the ground espresso to the pot, add water, and brew. If you have an actual espresso machine in your kitchen, this is going to be how you make your espresso. 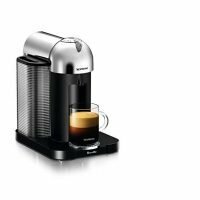 That’s a luxury item for us since we don’t drink espresso too often and I don’t want to sacrifice counter space for one either. 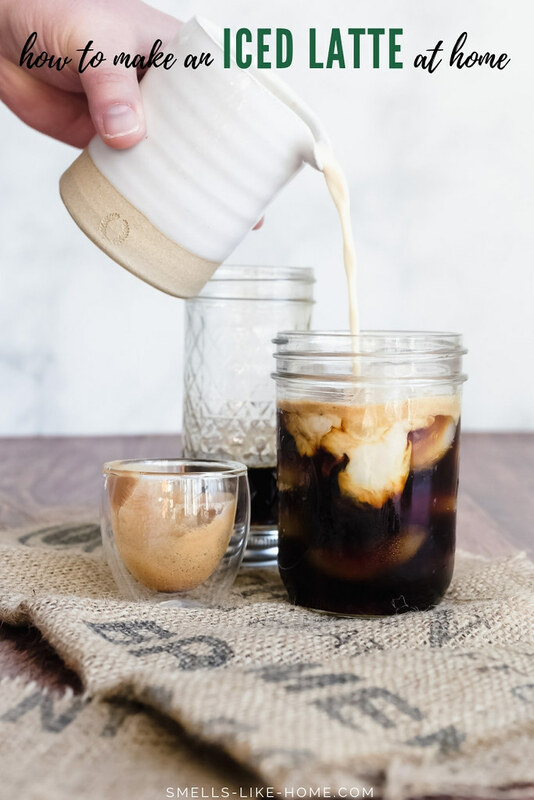 And of course, you can definitely stop by a coffee shop and order a shot or 2 (or however many shots you need) to bring home to make your iced latte. Before we had the Nespresso machine, I did this on a few occasions. How Do You Sweeten an Iced Latte? The ways you can sweeten an iced latte are almost endless with 1 caveat. I don’t sweeten any of my cold coffee drinks with granulated sugar because it doesn’t dissolve properly. Liquid sweeteners, however, mix easily with the cold milk and espresso and dissolve seamlessly. 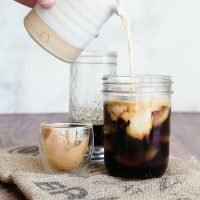 Flavored coffee syrup to sweeten an iced latte: My toasted coconut coffee syrup is always a winner. Though I haven’t tried it, the rosemary syrup I added to my mistletoe kiss cocktail might be a nice herby addition to your coffee. You can buy or make your own coffee syrup. 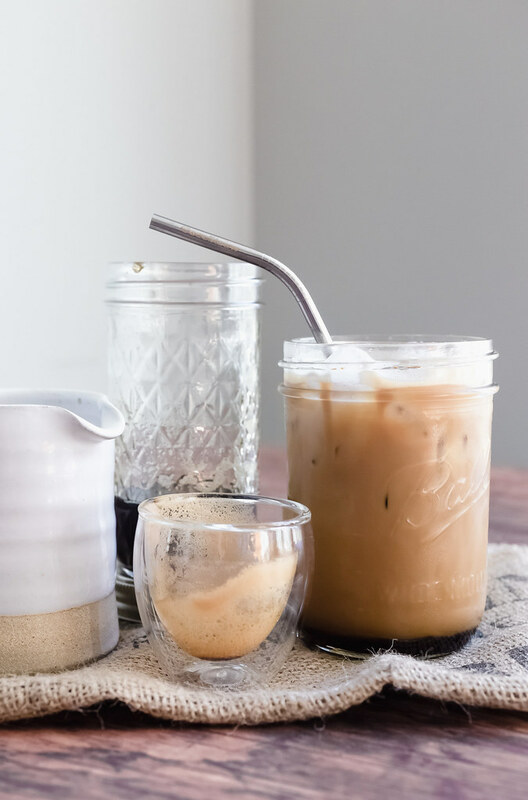 Maple syrup to sweeten an iced latte: This natural sweetener is a delicious way to sweeten your coffee, whether it’s hot or cold. Now you’ve made an iced maple latte! Simple syrup to sweeten an iced latte: This just a simple mix of equal parts water and sugar that you boil for 5 minutes. When the liquid is cool, it’s a basic syrup to sweeten your coffee with. Caramel sauce to sweeten an iced latte: Caramel sauce is an excellent way to sweeten your iced latte! 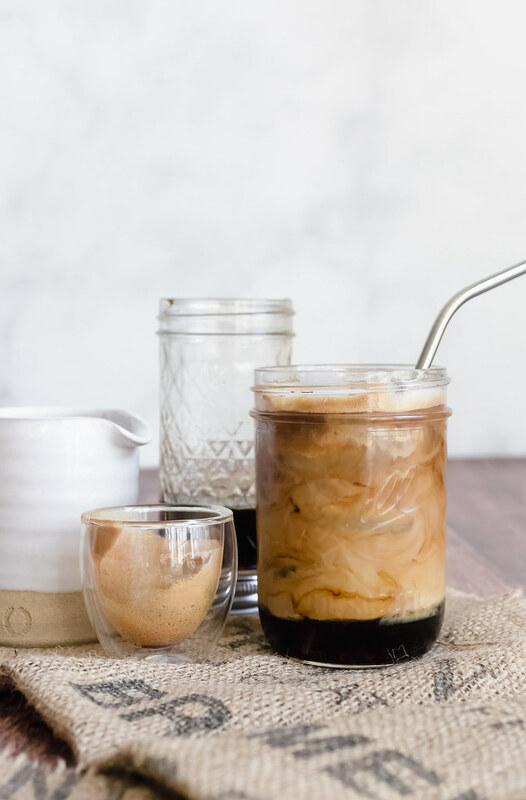 My vanilla bean caramel sauce will give an iced latte a sweet toasty flavor. My 3 ingredient salted caramel sauce will give an iced latte a sweet, deeply toasty, and slightly salty flavor. You can’t go wrong with either recipe but be sure you warm the caramel sauce a little to loosen it up before you add it to the iced latte. Honey to sweeten an iced latte: This is also a great natural sweetener for hot and cold drinks. 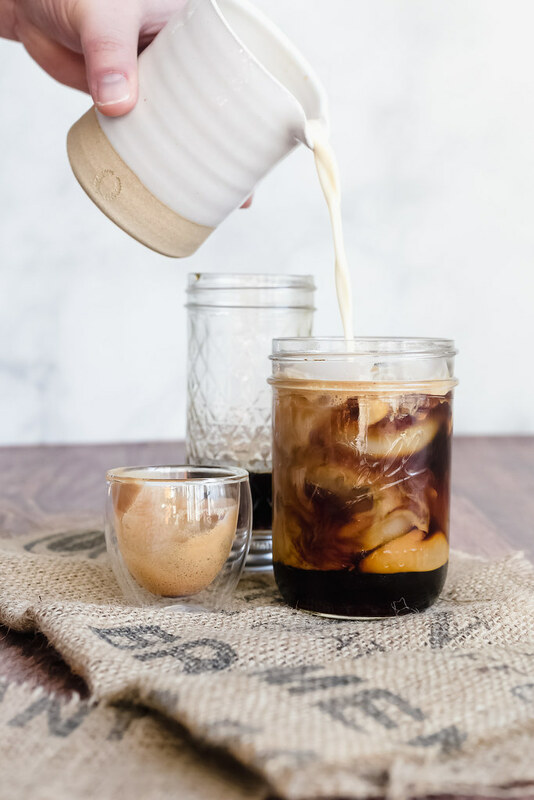 Honey will give your iced latte some floral flavor notes and it will enhance any naturally sweet flavors your espresso already has. Flavored milk to sweeten an iced latte: You can find some milk varieties that are sweetened these days. Vanilla almond and soy milk are both fairly common in grocery stores. Once you have your espresso brewed and your milk and sweetener ready, fill a glass with ice. Pour the espresso over the ice. Add the sweetener. Pour in the milk to fill the glass. Like I said, it’s super easy to make this drink at home! I hope you’ll make your own iced latte at home this summer! It’s a delicious drink, however you decide to make it, and it will cost you pennies on the dollar to make at home compared to buying it at a coffee shop! Let me show you how to make an iced latte at home! Use any flavor sweetener, milk, or boldness of espresso you choose and save yourself a ton of money in the process. Add the liquid sweetener to the glass. Pour milk into the glass and stir until the milk, sweetener, and espresso are combined. 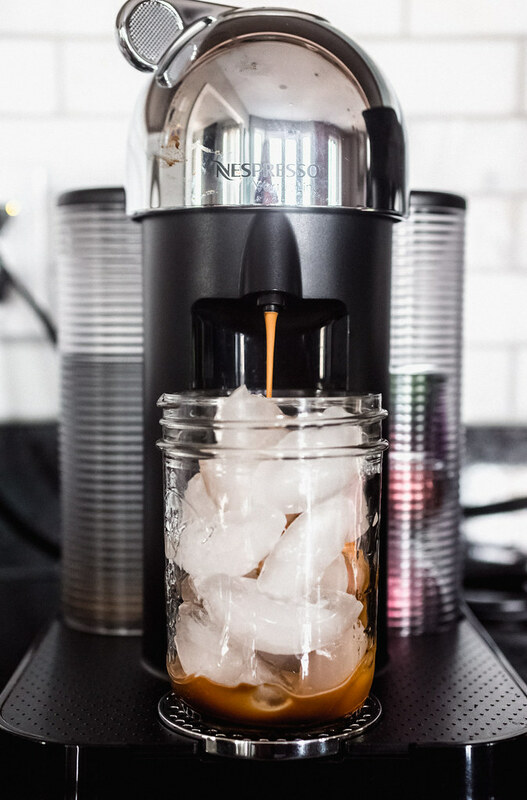 You can either brew the espresso directly over the ice if you have an espresso machine or make the espresso on the stove top and pour it over the ice. 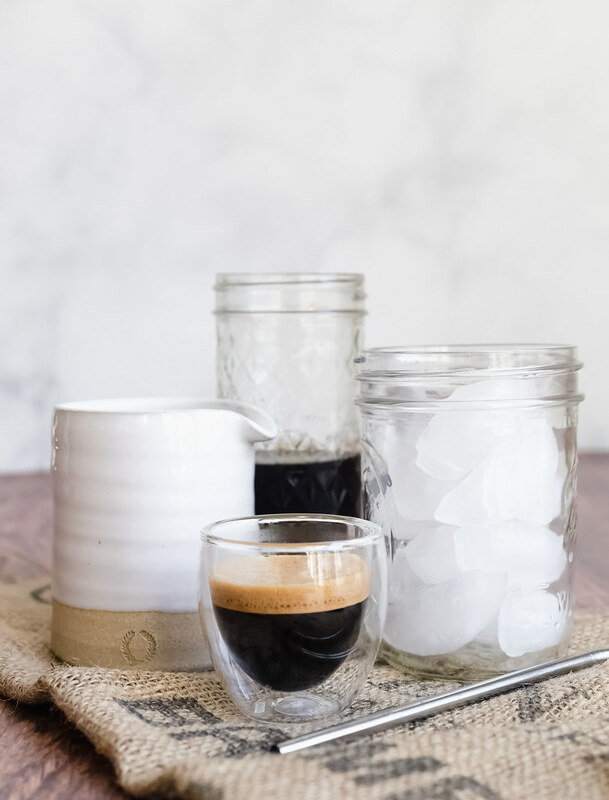 The espresso can be hot or cold when pour it over the ice. 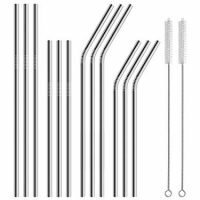 As a member of the Amazon Associate affiliate programs, I earn from qualifying purchases.